You may have heard of this phrase and it is a good one to remember for home cooks. I try to adhere to this motto but with time, I realise that it is easier to 'waste not' if one gathers more culinary experience and confidence. I am also learning to store my veggies and herbs, using the usual housewives tricks and tips. I have a batch of week-old basil and kaffir lime leaves which did not looked like they could go any further. And some leftover coriander roots which I was keeping for use in another dish. "Waste not?" Yes, indeed. Lets do a dish with these. I am not sure I can always agree with the second part of the motto. There is an excitement with trying out a new recipe. I want to. I remembered this attractive fried chicken recipe from The Principles of Thai Cookery by Chef McDang which had a beautiful pic of fried basil and lime leaves. As you read recipes in a cookbook (and drool at the photos), you are more likely to attempt a new one if you are familiar with the techniques and ingredients. 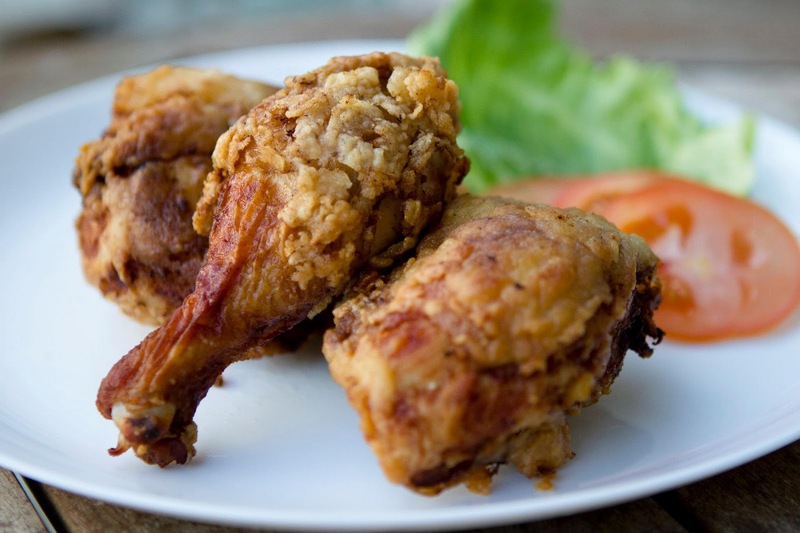 I have already cooked different types of fried chicken, one which I have already blogged here. I have also gone Western (or properly speaking: "Southern"). I am still tweaking the recipe but I will post a photo of it here. So, it is time to learn a Thai way of making fried chicken. And as one my of daughter is a chicken-lover, I know she will like this. Download the printable recipe in PDF here. I have adapted this from Chef McDang's. 3. Pound the toasted seeds, garlic (skin on), sliced lemon grass and cilantro roots into a paste. Alternatively, you can blend it if you do not have a mortar and pestle (sigh). Add the soy sauce, fish sauce and palm sugar. 6. Fry the chicken pieces in batches till it is golden brown. The time ranges between 10-15 minutes per batch. 7. Drain the fried chicken pieces. Then add the garnishes. Best eaten with rice, of course. If you cannot find basil leaves, you could give that a skip. But the other ingredients are all easily available. You can vary the amount of ingredients as you wish, i.e. increased the chili peppers. The fried chicken tasted wonderful, scented with the herbal marinade and the fried herbs. It was a new experience altogether for me (and my family) and I am glad to be acquainted with another way to make an appetizing chicken dish. It will make for a great party dish. A mouth watering chicken dish. I never tried this Thai variant before. Now I am clamoring for it.